I spent a LOT of time this weekend in my garden – cleaning the beds, weeding, pruning bushes, pruning an ailing Japanese maple, planting perennials. 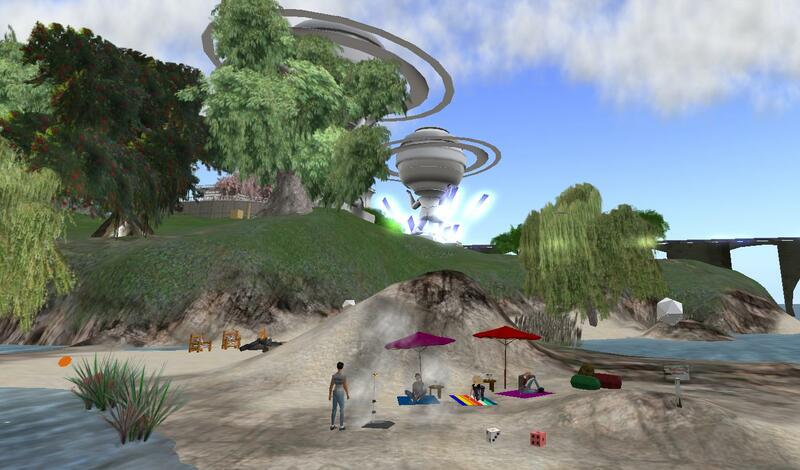 I came inworld in the evening for friends and music. Calli fits the bill for both friends AND music – she is one of my favorite DJs, spinning tunes at Tribeca and Fogbound regularly, as well as other locales. But with gardening on my mind, I remembered that I never mentioned Calli’s OTHER venture – besides her fantastic photography and DJing. We can now enjoy Fleur de Calli, a lovely little flower shop in Puli. It was early March when the shop opened. Still too gray and cold and miserable to be in my organic garden. Calli tp’d me into the shop and immediately I felt more relaxed and cheerful. FLOWERS!!!! 🙂 Beautiful orchids in graceful pots. You can change the color of the pots to suit your decor or mood. I found the white flower in the corner to be extremely striking. I asked Calli about it and she told me that it was the result of a mis-click when creating. Quite a fortuitous misclick, I would say! So the next time you need a hostess gift, or a little pick-me-up for yourself, or even just a visit to a clean, well-built space, drop by Fleur de Calli for your flower power. What profit has a woman of all her labor which she takes under the sun? So, perhaps you remember my garden? Remember my project leader J??? Remember how J always ultimately undoes my garden? *smile* Whether by making me pull the plants, or by removing the region or by returning them to my lost and found, J has a way of reminding me that all is vanity, nothing lasts. Funny, I never pegged J as a traditionalist, but this IS the season when we read Kohelet. And this is the season when J has yet again begun to remove my gardens, my trees, my work. Your 7 objects have been returned to your inventory lost and found folder by J near parcel ‘Room A’ at Room A 3, 179. Your 4 objects have been returned to your inventory lost and found folder by J near parcel ‘Room A’ at Room A 2, 221. Sigh. Mene mene tekel upharsin. My trees have been weighed in the balance and found wanting. Maybe if I’d learned to make better shadows? /me mutters several things under my breath that I’d prefer not to have overheard. *grin* Okay. Everytime J does this to me, she ultimately finds a better project for me. Or gives me a garden of my own in which to play. So I’m going to hope for the best here. 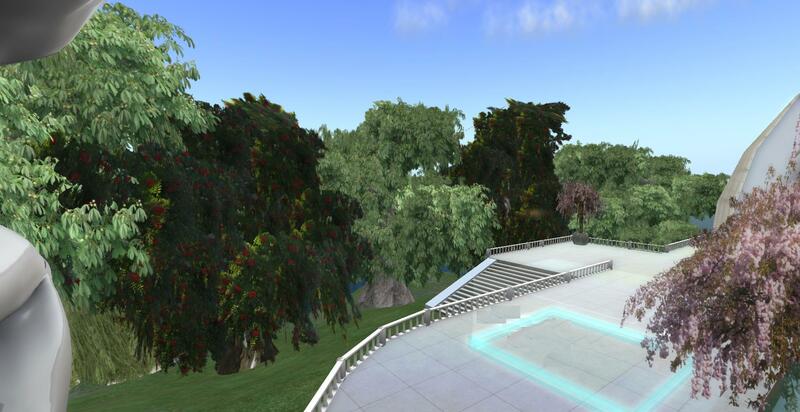 And remember that I not only have my own region elsewhere, but I actually have my own opensim grid. One more day…. just one more day and we should have recorded the footage we need to have achieved the current milestone. One. More. Day. But I am not the only one working and trying to make deadlines and submit machinima. The call went out from another group last week. 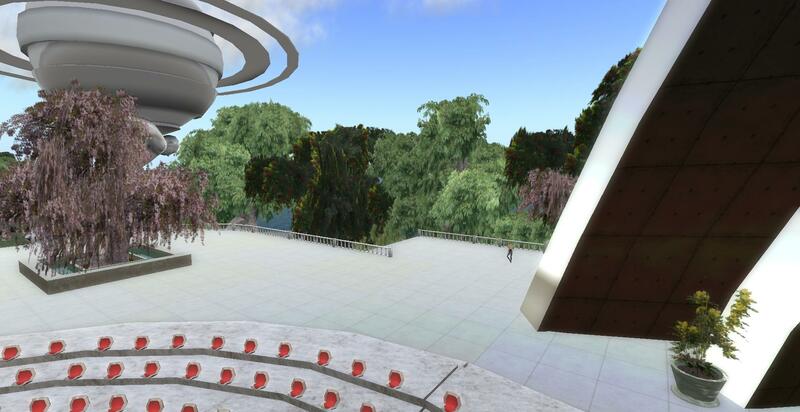 “We are recording life in our virtual world, we need some bodies. Please come and join us.” I can’t resist an invitation like that. First, because to me that sounds like a party. And second, because I know the day will come when *I* will be saying “Help! 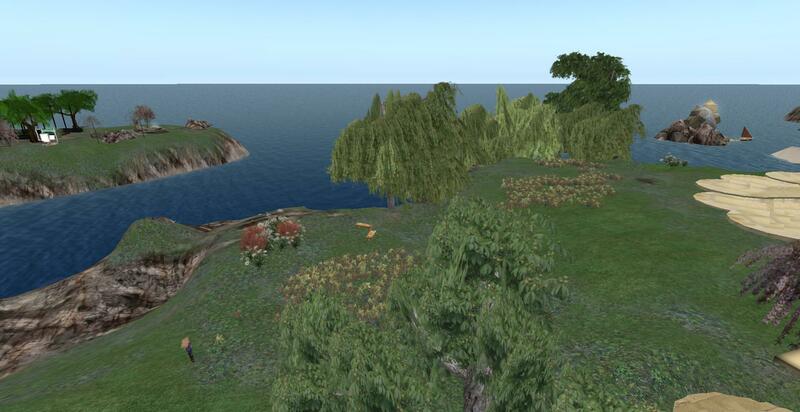 I need bodies to fill my virtual world.” So I blocked out the time on my calendar. I got there a bit early and settled myself at the checkers board I’d built last fall. 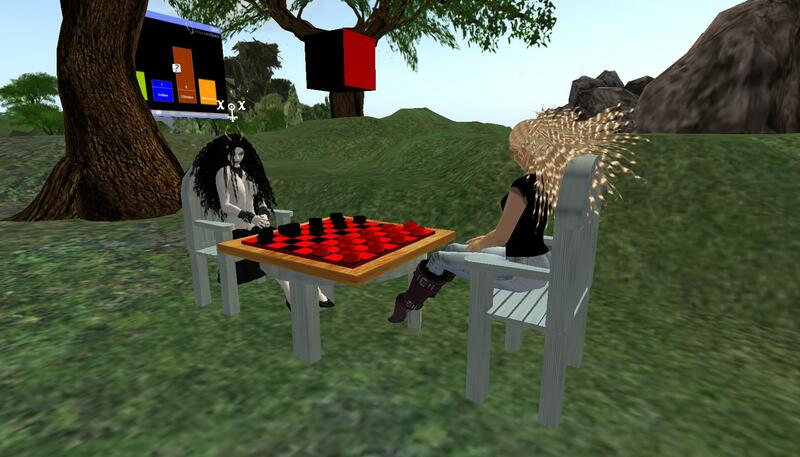 I was joined by a friend but as you can tell by the pieces, we didn’t really play. We were too busy negotiating terms of the game, prizes for the winner, penalties for the loser. I tend to think of the two of us as the Immovable Object meets the Irresistible Force. *grin* Fortunately more folks arrived before we actually had to play. We wandered all over the world, sim to sim to sim. As the scheduled time drew to a close, people began logging out. Until just a hardy few were left. I took them to MY favorite places: the beach and the duck pond. Someone has left a rocket launcher by the beach blankets!! We had a great time firing off the rockets, listening to the noises, watching the particle explosions. I was laughing aloud at my desk. It really was a wonderfully fun stolen moment in the middle of doing work. We tp’d to the duck pond so I could show them my ducks. Yes, those are MY ducks. I refuse to be mature or good-natured or a good corporate citizen on this matter. *grin* MINE MINE MINE!!! My team leader gave them to ME!!!! Oh. *clears throat* Excuse me…. Ahem. Okay, so I took them to the duck pond where we relaxed for a few moments more. Then it was time to go back to our desks – which are located in different states and time zones. 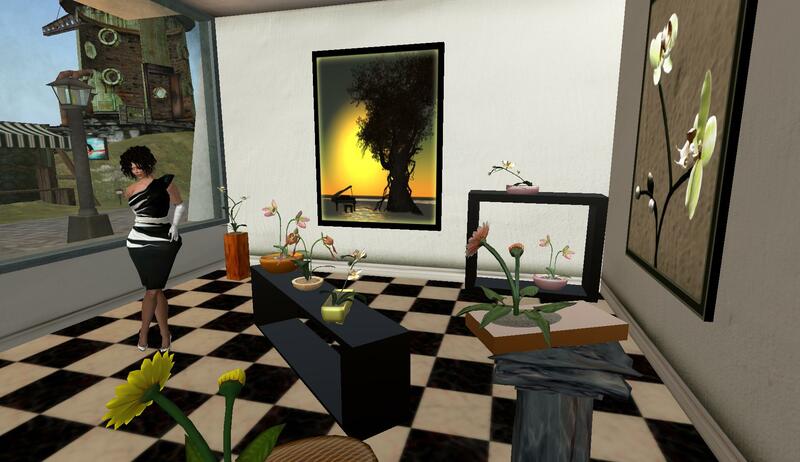 Virtual worlds provide a wonderful chance to share thoughts and experiences with people you might never have met in the purely physical world. As most of you know, I spent a good part of the 4th quarter working on landscaping a major project. I wish I were a better photographer. I wish I could show you everyone else’s work. I really REALLY wish I could bring you all into my world so you could experience it yourselves. The folk who built that world did an amazing job. But you will have to make do with my pictures and you will have to trust me as to the rest. Perhaps sometime photos will be released and I can direct you there. 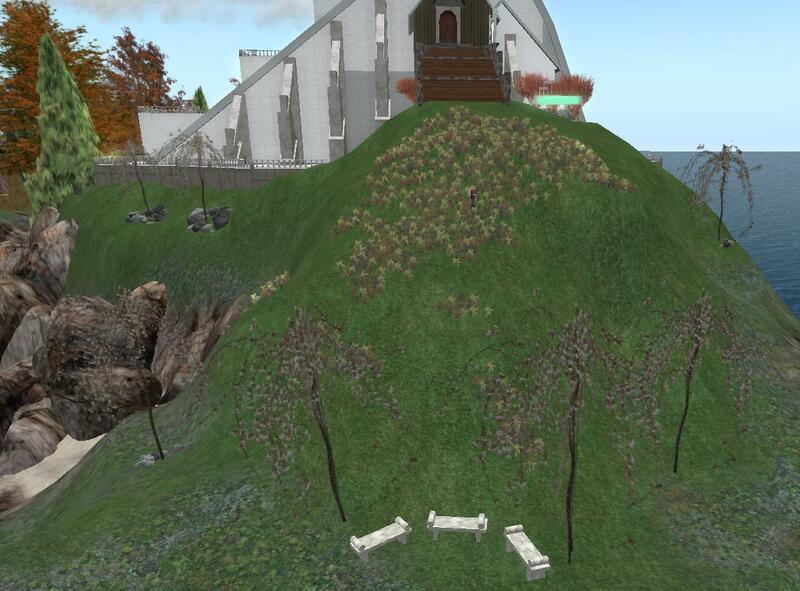 My first assignment (after the team song) you might remember was to landscape an island overnight. I’ve already posted about that and Dale riding to be my companion in creation. I did not have my full inventory of textures at that point so I did go back at a later date and add to it. Please note the ducks. 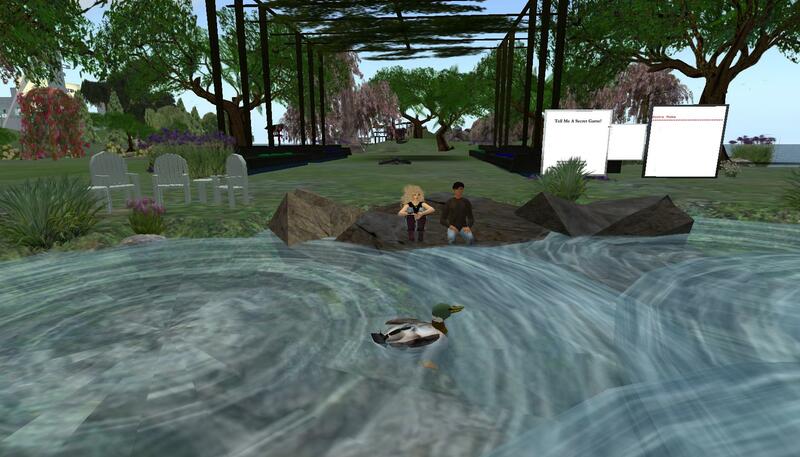 *grin* You will know you are at an authentic Ahuva build when there are ducks in the water. I learned a lot on this, as I did on everything I attempted on this project. I am quite pleased with the rocks in the water. They were one of my first attempts at creating my own texture. Yes, I see areas now where they could be improved, but as a beginning effort, they are not that bad. The chairs and table were already posted, but you can see the overall effect now. This was to be a garden social area – for relaxed meetings and a place for conversation. I had a lot of fun working with rocks. Actually, I always have a lot of fun shaping and placing rocks. 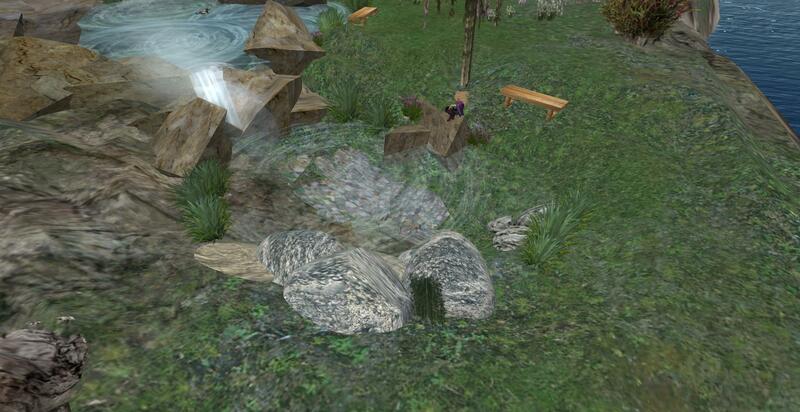 And yes – I really do place every rock and plant individually and turn and rotate each one. I almost never take groups and repeat them. We tried to make every place interesting as we figured newbies would end up all over the world – whether intentionally or not. *grin* We had many interesting sites under the water but alas – most were not my build and so I can’t show them to you here. I can tell you that the ruins and the diner were big hits. I added some benches and a tree in case anyone found themselves lost and in need of a rest as they tried to find their way back to the main action. There were many big open spaces. There was one that I nicknamed The Great Lawn. There was another area that I thought of as the Lesser Meadow. That is what you see here. The Lesser Meadow inspired me to figure out a way to have meadow flowers. 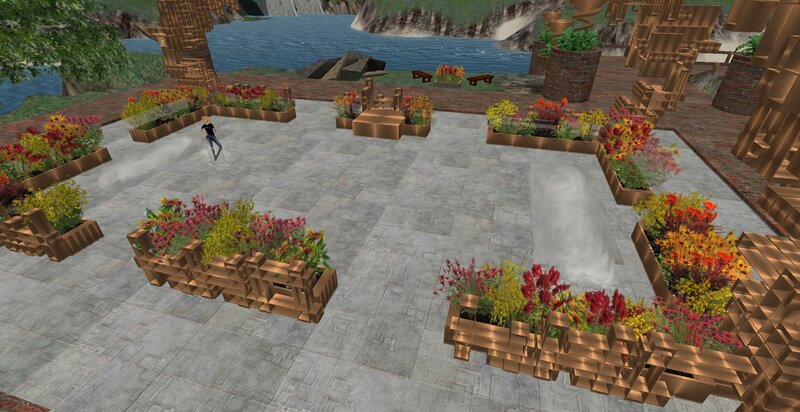 Okay – this is an area where I did indeed make clumps of flowers and copy the clumps. But uneven ground forces you to place each clump somewhat differently. I’m not sure that I like realistic terraforming anymore. *grin* I didn’t want to cram every inch with flora – life doesn’t work that way. Also, there were some nice views – I didn’t want trees blocking the sight lines. I tried throughout to balance small clumps of flowers, as you might find in rocky terrain, with larger groves of trees. We had what we called the House of Wonders. A phenomenal build. It was intended to help people master SL keyboard and camera skills. I had the job of landscaping the outside. Again, I did not want to do monumental landscaping. The building and its patio spoke for themselves. I reused the meadow flowers. They are even MORE annoying to place on a sloping hillside, trust me. I created the benches, thinking of Greek antiquities and relics. Somehow the cool white and simplicity seemed in place with the steep mountain. Likewise just the scattered rocks and a few weeping cherry trees. When the trees were still allowed to be flexi (let’s NOT revisit that horrible decision), I imagined the sea breeze blowing up the hillside, rustling the tree limbs and the flowers. To the side of one of the major theaters was some lawn and then a sharp drop to the sea. The theater itself was very reminiscent of Greek amphitheaters or a Maxfield Parrish picture. It made me think of romance and myth. I decided that a rowan grove was appropriate. The rowan tree has been considered magical by many cultures. Celtic tradition held that a rowan tree could offer protection against evil spirits. We all know that our computers are prone to attack by malicious malignant spirits. I did what I could to assure the success of this build. I’m not sure what my teammates would think if they knew my reasoning, but it’s too late now. The grove is planted. AND to the best of MY knowledge – all the presentations in THAT theater went well. So there, too. 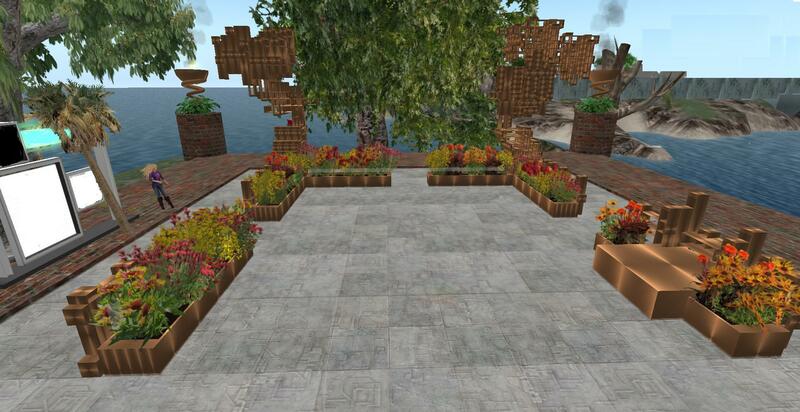 This landscaping was my absolute favorite of the project. 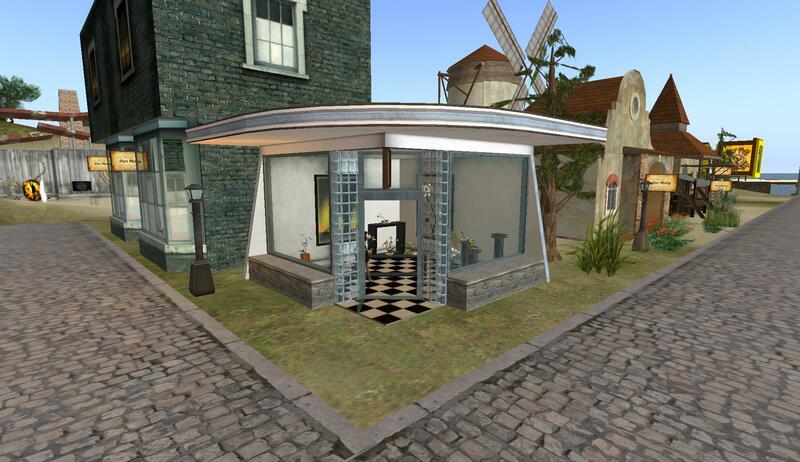 The build itself underwent several texture changes. It was originally wood, then stone and finally copper. The copper was perfect. I love copper. I have a lot of it in my fl home. Once the structures went to copper, I knew exactly what I wanted planted: fire. I wanted flowers on fire. Red. Orange. Yellow. My favorite colors for flowers. I took time with this but it went very quickly because I was so in love with it. You may not like it, but for me – this may be the best landscaping I’ve done, as far as suiting the environment and the colors. I KNOW that it was a good job because my project leader, who very rarely had any comments, actually said “This is nice”. /me closes eyes briefly in pain at “nice”. But the point was that it was worth comment. *grin* You have to learn to read between the silence. I’m going to buy a sim. I’m going to fill it with flowers, trees, bushes, grass. All the textures are going to be 1024 x 1024. Every plant will be made of flexi prims. The colors will be warm. Not a gray wall in sight. 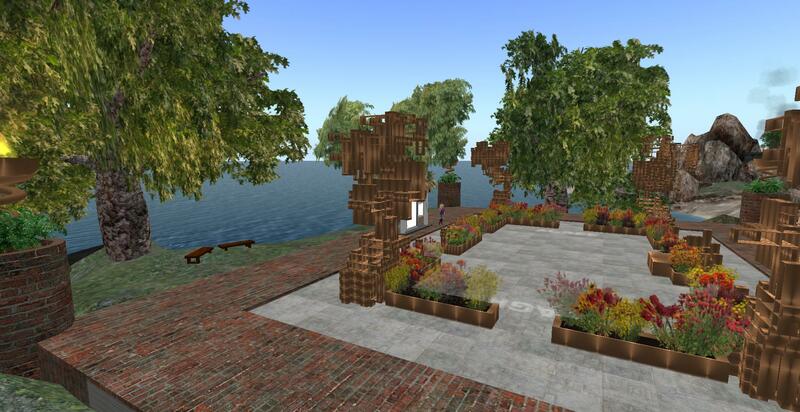 There will be meditative gardens with sculptures. It will be crammed with things pleasing to my eye. 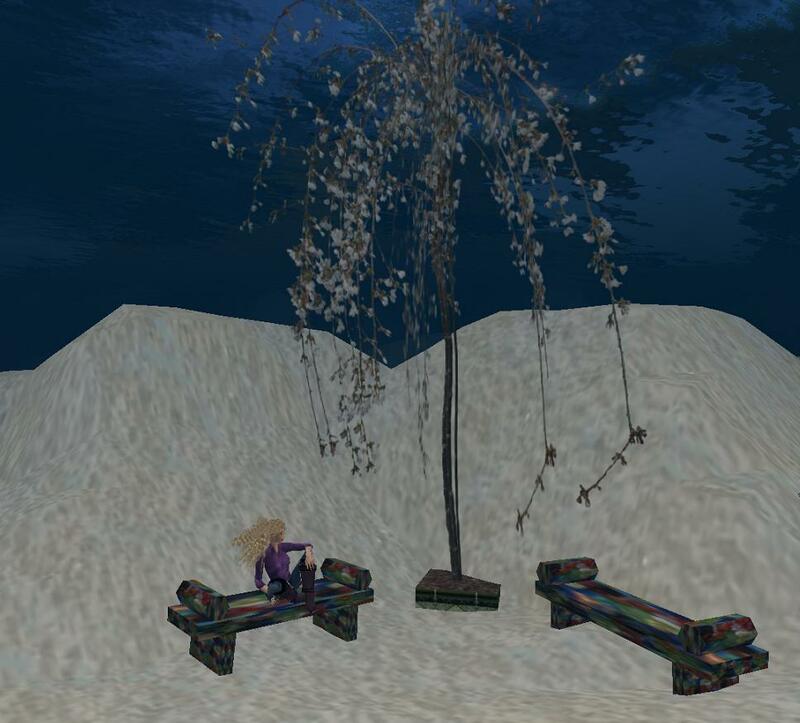 Bamboo and I will sit amid the flowers and be happy. I don’t care if you lag. I don’t care if you can’t move. And we’re doing it my way.